A fellow vegetarian friend introduced me to a fantastic breed of restaurant: vegetarian Chinese. If you live near a major city, there’s probably at least one nearby. Basically, you walk into what appears to be any old Chinese restaurant, and order from a menu that looks just like any ordinary Chinese restaurant menu. The twist is that dishes include no indication of whether or not they are suitable for vegetarians, because everything is vegetarian. It can be a little freaky at first, ordering something you’d never order at a conventional Chinese restaurant, but you get used to it pretty quickly. One of those staples of American Chinese cuisine not normally suitable for vegetarians is General Tso’s Chicken. This simple dish consists of crunchy stir-fried broccoli alongside battered chicken, doused in a sweet-meets-salty soy-garlic-vinegar sauce. The vegetarian version I had at this restaurant, which is so good it made the friend who suggested it to me cry, is one I always suggest it for vegetarian-Chinese newbies–even omnivorous ones–and they love it every time. It features battered and deep-fried seitan in place of the chicken, and the whole thing is smothered in candy-sweet sauce. Couldn’t be too tough to create something just as delicious as this veggie Chinese-restaurant favorite, I thought. (Fried + loaded with sugar usually results in some good-tasting food.) I wouldn’t go so far as to call this version healthy, but it’s definitely better for you than most restaurant versions. My General Tso’s Veggie Bowl uses pan-fried seitan and a sweet—but not over-the-top sweet—sauce. You won’t even miss the deep-frying or the extra sugar. This stuff is rich, scrumptious and will win over anyone you serve it to, vegetarian or not. Sorry in advance if it makes you cry. This post was originally published on August 6, 2014. This vegetarian take on General Tso’s Chicken uses pan-fried seitan and crunchy broccoli, covered in a sweet (but not too sweet) sauce. Pour 1 inch of water into a large saucepan or wok and bring to a boil. Add the broccoli, cover, and steam until it’s bright green and tender-crisp, about 2 minutes. Remove the broccoli from the pan, drain and set aside. Place the cornstarch and seitan in a large plastic bag and toss well to coat. Heat the oil in a large skillet over medium-high heat. Add the seitan cubes in a single layer. Cook for 3-5 minutes, or until crispy and golden brown on the bottoms. Gently flip and cook another 3-5 minutes on the other side. Remove the seitan from the skillet and transfer to a plate. Add the garlic, ginger and chili peppers to the skillet. Sauté about 1 minute, until the garlic and ginger become fragrant and the chili peppers start to blacken. Add the sauce, seitan and broccoli to skillet. Flip a few times to coat seitan pieces. Cook for about a minute, just until the sauce thickens. Divide among bowls. 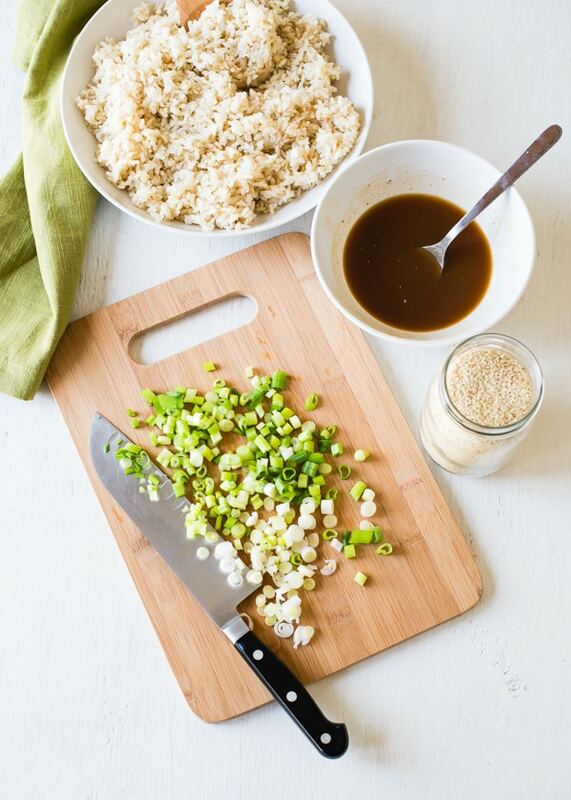 Serve with rice and top with sesame seeds and scallions. Believe it or not, this is a mild version of the dish. Increase the heat by doubling or even tripling the number of dried chilies, or adding a bit of Asian chili paste. General Tso’s is my favorite! Will definitely make this! This is the perfect dish for meatless bribery! Excellent! Hope you enjoy it!! This looks so delicious and flavorful! I must give it a try! Wow love the veggie twist but I have never tried or heard about seitan before? Any thoughts? Thanks! Seitan is a meat substitute made from seasoned wheat gluten. You can pick it up in places like Whole Foods or you can make your own. I definitely recommend giving it a shot! Would I be able to substitute tempeh for the seitan? If you substitute tempeh you’ll probably want to skip the cornstarch coating and just pan-fry it plain. I haven’t tried this recipe with tempeh, so I can’t say for sure how it will work out, but I think it would be good. Please let me know what you think if you do give it a shot! I made this tonight with tempeh. Of course I didn’t see you comment about skipping the cornstarch, so followed your directions to a “t”. It’s good! I’ve been a vegetarian so long, I’ve never had General Tso’s chicken, so have nothing to compare it to. I added carrots and next time, I’ll steam even more veggies to add. It’s a great base with a very flavorful sauce. Thank you!! 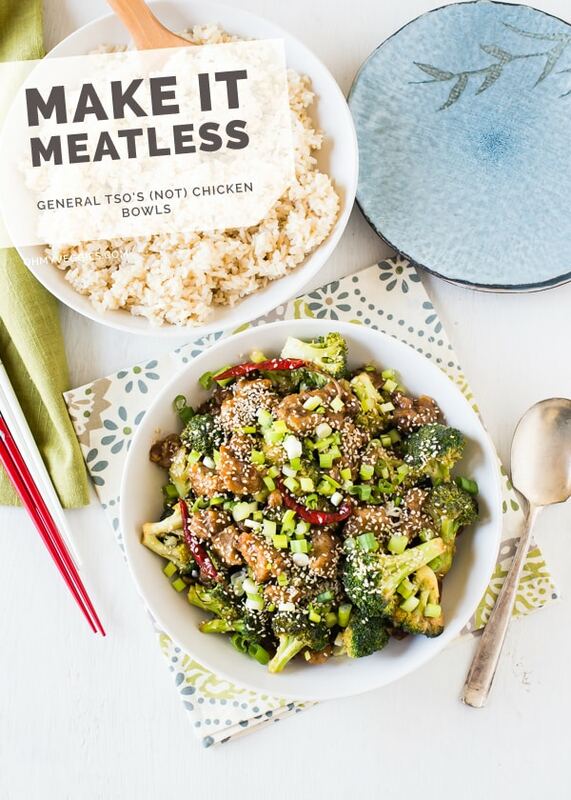 i definitely could devour a bowlful of this right now.. will be recreating this recipe for my vegetarian household. thanks for sharing! I know this is ridiculous, but I’ve never had any kind of General Tso’s Fill-in-the-Blank. Looks like it’s time for that to change! General Tso’s is the popular favorite for a reason. You’ve definitely gotta try it! Thanks Deborah! It was delicious and really easy to make! Hey I made this last night it was super tasty! thanks for sharing! I didn’t have chili peppers so i just used cayenne powder and it made it plenty hot. Yes! So glad to hear it! Also good to know the recipe works with cayenne as a sub. Thanks so much for sharing!! This is the mild version? I’m deffo making this, but i might make a baby version! Haha! Yeah, the sauce itself is pretty mild. The dried chilies only infuse it with a little bit of heat, so unless you bite right into one it will be very mild. It should still be tasty if you leave them out altogether though. Enjoy! I’ve been to a vegetarian dim sum place here in NYC many times, but never just a straight up veg Chinese restaurant! Must seek out. And make this general tso’s at home. It is one dish I miss since going veg! I’ve never had General Tso’s chicken but my boyfriend orders it every time we get Chinese take out and he confirmed the “tso-yness” of the sauce. It was really, really good even with a bunch of questionable substitutions. I used flax to thicken the sauce because I don’t have cornstarch. I used tempeh instead of seitan and pan fried it without the cornstarch coating. I used regular homemade barbeque sauce instead of hoisin, AND I was out of veg base so the sauce just had water and a dash of onion powder instead of broth. No sesame seeds either (I need to go grocery shopping apparently). So the recipe is pretty flexible. Will definitely make it again. Great to know it was tasty, even with all of those substitutions! For that matter, it’s great to know that the recipe is so flexible. I’m glad to hear you and your boyfriend enjoyed it. Thanks for sharing! Mmm! I made this for dinner tonight and I loved it! This was the first recipe I’ve made from your site and now I’m really excited to try some more. Sadly I couldn’t find any seitan at my grocery store (I couldn’t even find any tofu), but they had tempeh so I used that instead and it still turned out fantastic. I’ll definitely be making this again, it was really easy to do and really satisfying. Another great vegan recipe! Thanks Alissa! One question: what kind of chilies do you use? From the photo it looks like you’re using some kind of dried cayenne peppers? I used Thai bird eye chilies which were great – they are VERY VERY hot, but only if you break them open, and it seemed like all 15 of mine stayed intact. At any rate, thank you again, love this recipe! Thanks so much Amanda! You should be able to find the chilies I used in the Asian section of a well stocked supermarket. If not, they’ll certainly be available at an Asian market. They’re usually sold in bags and might be labeled as Chinese or Sichuan chili peppers. Cayenne, Thai chilies and most other types of red chili peppers work just fine as substitutes though. I’ll sometimes just substitute some hot sauce in a pinch. My meal came out a bit over cooked to make up for having to make sure the chicken was cooked all the way through. The chicken should have been cooked through after the minute simmering. If you’re using seitan you don’t need to worry about it being cooked all the way through – seitan is fully cooked as packaged. I hope that helps! Oh yes, yes, yes!! I am a General Tso’s fanatic, so this sounds amazing! My daughter can’t decide if this is her favorite recipe or one other thing I make for her. This is really very tasty. I have served it multiple times and everyone loves it. Thanks for posting. Just wanted to say thank you. The recipe is amazing. I just made this last night. It was amazing then, and it was amazing today for leftovers too. I didn’t have whole chilies so I used 1tsp crushed red chilies. I also added 1C carrots. It came out great, though I’d love to try it with the whole chilies next time. Thanks for the great recipe! Glad you liked it, and carrots sound like a perfect addition! Thanks so much, Susannah!